A willingness to try a clinical trial, plus his own brand of humor, are helping this man beat advanced cancer. It would be hard to find a more affable person than longtime Durham resident Tom Drew. Even as he is being treated for advanced melanoma, he is determined to find humor and make new friends. Seven years ago, Drew discovered a pea-sized place on his scalp, which was surgically removed and diagnosed as melanoma. After surgery, he was considered cancer free and lived five years feeling home free. Then, two years ago, he experienced a dizzy spell, and his worst fears were confirmed—the melanoma had moved to his brain. In the hospital for radiation treatment, he set up Team Tom. “My room had one of those white boards, so I wrote Team Tom across the top and welcomed each caregiver to the team and told them we’d try to have some fun,” recalls Drew. 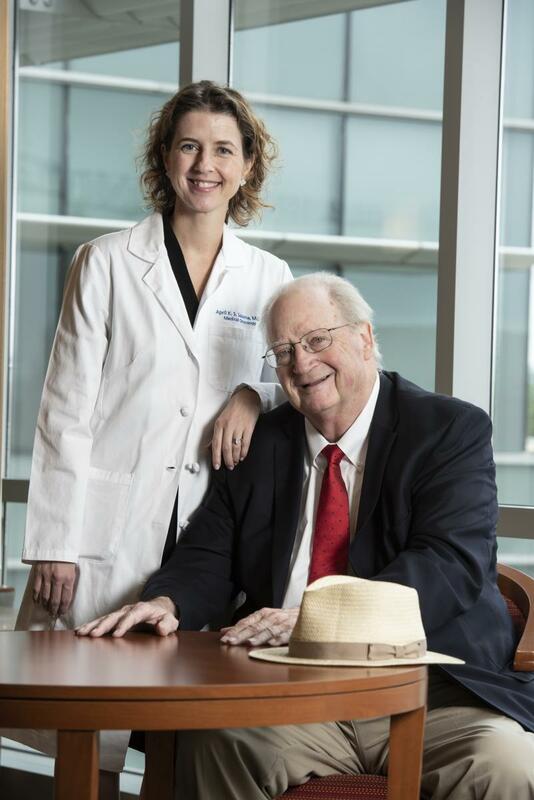 His oncologist, April Salama, MD, associate professor of medicine, was a good person to have on Team Tom, as she is director of Duke Cancer Institute’s melanoma program, and as such has intricate knowledge of Duke’s broad array of clinical trials. “Ten years ago in melanoma, long-term survival was virtually unheard of,” Salama says. “Now 50 percent of patients with previously incurable disease are living years. Another element that sets the Duke melanoma team apart is their multidisciplinary approach. “We’re in clinic together with dermatologists, medical and surgical oncologists, radiation oncologists—so we are getting a collective opinion, offering a focused expertise across the spectrum of melanoma,” she says. Salama guided Drew to some of the standard immune therapies that have benefitted many patients, and the tumors initially shrunk. However, after 10 months, new tumors in the lymph nodes in the abdomen turned up. Salama directed Drew to a new clinical trial. Drew is currently doing well on a treatment that is suspected to work by turning off cells that may act to “hide” the cancer from immune-system cells. He continues taking the drug even though the original clinical trial has since closed. “He is doing well more than two years after a diagnosis of metastatic melanoma, which was almost unheard of at the time he was originally diagnosed in 2012,” Salama says. She adds that it is precisely patients like Drew, who are willing to participate in clinical trials, who have made such advances possible in a relatively short period of time. Drew cannot say enough kind things about Salama. “She comes into my room and holds my hand while discussing my options. You know she’s special from the time you meet her. She becomes friend, sister, mother to you. And the team approach is wonderful,” he says. Despite the success Salama and her team are experiencing, she is not satisfied. And Drew isn’t resting either. He lives life fully, still working at his fundraising consulting firm, enjoying his family and the many friends he has made on his medical journey. This article appeared in the Fall 2018 issue of Breakthroughs, a magazine produced twice yearly by Duke Cancer Institute Office of Development. Subscribe to Breakthroughs.